Those pics look great! I have to wait another month before upland season opens here in IL. I'm trying to remain optimistic, but pheasant populations have been dwindling rapidly around here. I may actually try some public land, I've never done it before and don't know the rules and etiquette. IL has rules about everything, so it's not hard to steer wrong. 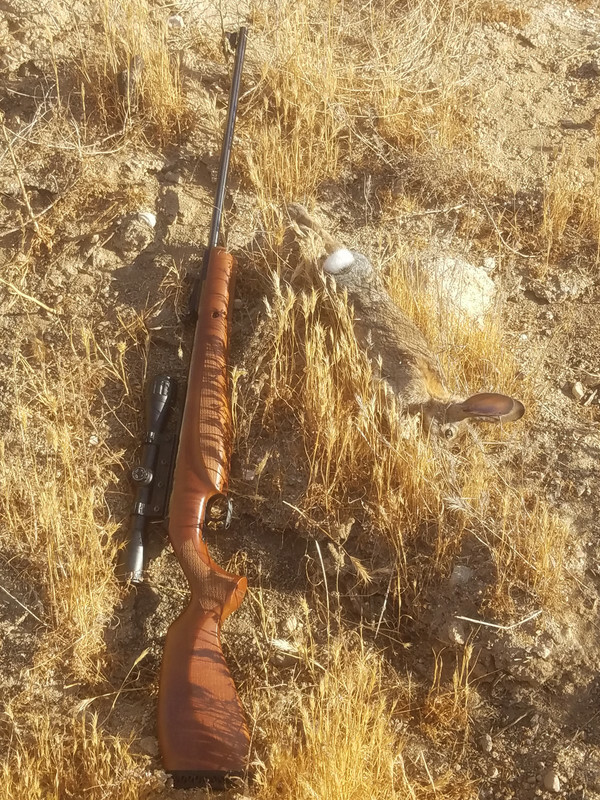 Took my new rifle out for a walk while scouting for quail today. I planned to test its accuracy on bullseyes out there, but the wind was stiff, so I opted for practical shooting instead. I zeroed in my rifle using normal field shooting positions. Aimed at little pebbles between 10 and 60 yards away and made scope adjustments as needed. The mil dot and AO scope is great for this rifle. The pellets drop fast after 40 yards but the mil dots help with that and the wind. I can really hit with this thing! Not much game here, yet. It needs a wet year. Fire went through here two years ago and still drought conditions. No sign of quail and few rabbits, not even Jacks. This area used to be loaded with game. But this little guy showed himself to me at 47 yards away. One shot through the head off hand. It was a nice afternoon with son 2. He ate the rabbit for dinner. Deep fried. Nice rifle, Thunk. Been a long time since I ate fried rabbit, or any rabbit for that matter. I used to brown it, remove from the pan and make gravy, then put the meat back and simmer. Veg's and rice goes along well, as well as a beer. Also btw, it's illegal to shoot any game birds with a rifle in Texas, even a pellet rifle. Without incriminating myself, I'll just say that I didn't realize that as a kid. Thank you. I'm in California again, for now anyway. But I wasn't hunting birds, just scouting for them to hunt at a later date with shotguns and dogs. I probably should have made that more clear. Having said that, one may shoot game birds with pellet guns in CA as long as they aren't the migratory kind of bird. Not sure if this is the right place. Durango will probably understand why. I have the incredible good fortune to be invited to Woodmont Lodge in Maryland this Sunday through Monday. It's a bizarre itinerary. Walked up pheasant, driven pheasant (not my favorite-a real challenge, to be sure, but in the wrong hands, a real slaughter), and driven Turkey, of all things. Apparently they even have a turkey catapult, which I would disagree with on moral grounds if I didnt consider turkeys to be an abomination. Anyway, I'm hoping to snag a smoke out of Sitting Bull's peace pipe (apparently he handed them out like Rockefeller dimes) which sits on the dining room table. With any luck, it's some actual hunting. Very nice! How exactly does one get invited there? BTW, driven turkey? Now that is an abomination, in my opinion. Sounds like a very interesting hunt. Take some pics if you get time...gun and bird and pip and dog photos are the best. Well, anybody with the dosh can go there. It's no longer private, in fact it sits on public lands from what I can tell. Hunting licenses are required. My best friend and his family were having dinner with us on Saturday last and he invited me. I dont know what I think of the turkey yet. I think it will be like driven boar---running birds in the forest, tricky shots, but I'm unsure. Theres a real possibility I'll sit that one out. There is only so much killing in any of us and I dont want to waste it on a dumb bird I dont particularly want to eat. I prefer the Gabriel-style walked up birds, respected and eaten, to slaughter for boom-boom's sake. To be honest, I'm more stoked about staying in the lodge with some good friends who just happen to be good shots. And scratching some happily muddledup dogs. It sounds like an Americanized European driven hunt, that’s all. Enjoy. It all ends up in the same place no matter how it’s acquired. Our job is to do it as cleanly as possible. It’s about the company and good shooting anyway, right? I never did anything like it, but I would love to do an English driven pheasant hunt someday, but rough shooting over spaniels and retrievers would be even better to me. I have no desire for driven large game. Just not my preference is all. I prefer a stealthy approach to big game. Come to think about it, now that I can hunt small game and non game with air rifles, I can see the appeal of spot and stalk or stand hunting small game too. Especially in early season when the snakes are still out. After my dog got bit by a rattle snake this summer, I’m really cautious about taking them afield until it get good and cold. Traditions run strong in hunting, yet they adapt to new game and different ecosystems. Some guys won’t shoot rabbits when hunting quail. Not me, I like rabbit, but I prefer taking rabbits with rifles. So when a target rabbits, I leave the shotgun at home, I’m a rifleman first. Of course game birds on the wing are neither safely or effectively taken with rifles, so shotgun it is. When I'm hunting quail I stick with quail out of respect for my dog. Unless she happens to point a woodcock or some other game bird. If she points a rabbit or something else like a mouse or small bird ("stink bird"), I just ignore her and keep walking. If she chases a rabbit or deer I call her back in and voice my displeasure. It annoyed me greatly last winter when a friend of mine and his son were taking shots at doves flying over while we were hunting woodcock with dogs. And it was easy to see the dogs' being affected. Further, it really annoyed me when his son showed up with his Benelli 12 ga magnum auto waterfowl gun, and especially when he would quickly fire three rounds at a flushing woodcock regardless. I will not hunt with him (the son) again. I never hunted over pointers. Interesting to hear how it goes. We actually want the dogs (spaniels and retrievers) to flush and retrieve all game. They love it! As long as they stay within range while quartering it’s all just fine. Of course, spaniels also must learn not to flush “tweety birds” as we call them. We don’t want the dogs to waste time and give signals over nothing. So how does it affect the pointing breeds? Just curious. Do they simply lose discipline? Just so that you know, I always find out what the other hunters in a party expect. Having said that, I have been hunting with the same group of a half dozen people for years. It works. We haven’t invited others in for a while either because we know how we like to do things. Just the way it is. And hunters with pointers and hunters with spaniels proabaly don’t mix well very easily very often. Just to be clear, there's no wrong answers here. I'm in a season of my life where I hardly enjoy quail hunting without a pointing dog. In fact when I was in between dogs a few years back I didn't go except once and it was with a friend and his dog. I love watching the dogs work, and watching and learning your dog is a very large part of training a bird dog. And, knowing your dog is a very large part of working (hunting) the dog. We were in a close area with heavy cover woodcock hunting, and much of the time the dog was out of sight, and I was listening for the bell (on the dogs collar) to stop, which would indicate a point, and when my friend would shoot at a dove, the dogs would leave their hunt and come find us. My dog was looking at me and I could read her mind. Don't ask me how. If Durango is reading this, he'll tell you better than I can. I would shoot any flushed birds. Sounds like you would too. Cant expect the dog not to point/flush birds out of cover. Shooting doves and quail simultaneously would just confuse the hell out of a good dog...what's the poor thing supposed to pay attention to? Woodcock, well, I'm conflicted about woodcock. I've shot them and I've let them go. I just find it hard to believe any man could look at a woodcock he just killed and not realize he has more than original sin to contend with. I'm stricken every time. I'm getting that way about shooting woodcock too, more and more. Totally understand, and very well said, btw. I can relate to only wanting to hunt quail with a dog. For practical reasons alone, bringing downed quail to bag often requires the help of a good dog. I enjoy watching the excited spaniels whose tails wag just that much faster when they get close to game, their willingness to wiggle themselves almost anywhere to get to them too, though thankfully they know their limits. I hunted ruffed grouse with labs and mountain quail with labs and spaniels. The thick cover makes it very hard with these dogs in our attempt at keeping them close enough to see, most of the time we just need to be ready to shoot at a moments notice. But I confess that more than a few times lately, I’ve thought of selling some guns to buy telephoto lenses. I love the hunt for reasons far beyond the dogs, and snakes worry me because I like my dogs so much. I almost lost one dog to a snake already as you know. There are many reasons I hunt and some reasons out rank others. Like you said, there’s no wrong answers, just preferences. It is categorically wrong to shoot at a roosting turkey or ground sluice a bird. Dont leave a 20 gauge shell in a 12 gauge barrel. Cover me twice and expect to be physically assaulted. Dont try to hit anyone with falling birds. Finger off the g-d trigger until you are ready to fire. Any man with brand new hunting clothes is the man I stand behind in the field. A man who comes out in blue jeans and a semi-auto duck gun knows his business. I may not say anything, but I'll cut you dead on the street if I see you beat your dog. Dont leave birds if you can find them. These are the only things for me that are hard and fast rules.
. . . Dont try to hit anyone with falling birds. . . I took Mrs FredS's cocker spaniel, Floyd, squirrel hunting once. I shot a squirrel and it fell on the dog. Floyd took off and disappeared for two weeks. Luckily it was just across the road from a little farm house I was renting so Floyd eventually found his way home. He smelled like rotten fish. All very reasonable, but possibly one. I've wanted to take the semi-auto duck gun from the hands of a few blue jean wearing idiots. Hell I think I did at least once. This. I’d only add that I prefer to hunt with people who treat every creature they hunt with respect and gratitude. A lot of territory covered in the last page or so! Regarding Woodmont Lodge, I understand that “hunts” there are over pen-raised birds, hence, I suspect, hugo’s qualified use of the term. Perhaps the preference for rough hunting over driven birds (a shared preference) also contributes to the qualification. I have never taken part in a driven shoot, but I was once invited to participate in a double gun tower shoot - a combination side-by-side gun event and a simulation of a driven shoot where hundreds of hard flying pheasants were launched from a high tower to simulate high, driven birds. It was just that, a shoot. Not a hunt. Dogs worked as retrievers only, not as pointing dogs. It was a slaughter. I walked back to my rig after maybe a half hour or so and already an ungodly number of dead birds and sat with my dog until the shoot was over. The organizer gave a few of us permission to walk the surrounding fields with our dogs to hunt up birds that had escaped. My dog got some work. I got to do some hunting. And we were much happier off alone together. Depending on the facilities where the birds are raised, pen raised birds - as you know - can be quite disappointing or pretty wild seeming. Given the loss of habitat we’re facing, sadly, pen-raised birds will be all some bird hunters will ever know. It would be great to get a report after the shoot, hugo. My understanding is that Woodmont was all private until the land was donated to the state under a complex agreement that involves private club use during part of the year with public access during other times and different rules on different parts of the property. I’ve never been there, but I’ve seen pictures of the clubhouse and it looks absolutely beautiful. As far as gun dogs and critters you're not hunting . . .
My experience with my own dogs is limited to English setters, but I’ve hunted upland over a fair number of friend’s pointers, shorthairs, Brittanies, a Spinone and one pointing yellow lab! I’m probably forgetting a dog or two. In my experience regarding that particular behavior some is a consequence of breed and some of it the individual dog. My dogs only very rarely pointed tweetie birds if we were hunting and there were game birds around. When they’re playing in the yard at home and not hunting they point tweeties all the time. They seem to know what’s expected of them on a hunt. I had one setter that pointed a few tweeties early on, but after being called off rarely pointed them again while hunting. Although I always thought I would very much like to learn the ways of woodcock and see my dogs work them, I’ve never had the opportunity. Glad the new air rifle is a shooter, Thunk. 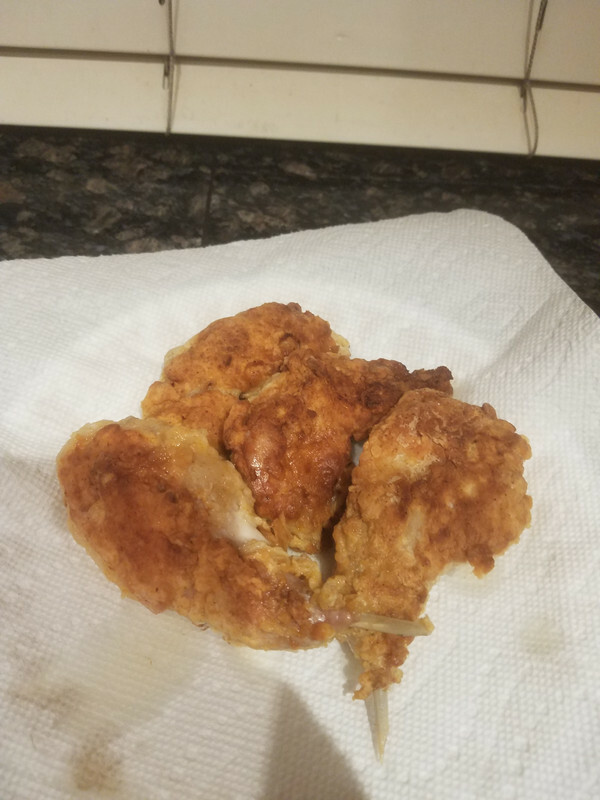 That fried rabbit looks mighty good.